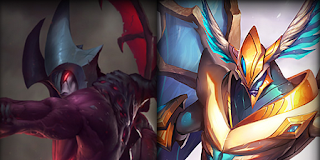 In this detailed article, It will explain to you on how to maximize your ability skill order for aatrox. It revives aatrox but it does a little bit heal. Still it is a useful skill and can change the tide of the battle. Additionally it has a attack speed buff depending on your blood in well. It has a long cooldown of 225 secs. This is your ganking skill, it leaps aatrox to a targeted area and deals damage with knockback effect. You can use it for initiating or escaping, still a handy skill. It gives you a good amount of blood on your well, it synergize well on your skills. This skill loves jungle, it helps you to stay in the jungling while gaining some gold. It needs attack speed to fully utilize the Blood Thirst. You can use this in your lane when enemies are always harassing you. This skill is the opposite of Blood Thirst. It gives you a high damage at the cost of your health. So you must use it wisely when engaging an enemy hero. This what makes aatrox dangerously but at the same time makes aatrox a glass canon. This skill travel in line deals damage and slow to enemies. You can use it as a harass tool and at the same time pushes the lane. This skill has a lower cooldown compared to your other skill. You need to master it because it moves slow and hard to aim. This is your Ultimate skill. It deals damage to any nearby enemies and it gives attack speed and range to your Aatrox. A powerful buff and powerful damage. Aatrox is still a melee just incase for item compatibility. This is very effective on an enemy hero who does not have an escape skill. This skill very useful in team fights. Get Blood Thirst/Blood Price first to be able to use the blood thirst in the top or jungle lane. Follow it up with Blades of torment so you can harass/farm in your lane. Dark Flight at third level for escaping or chasing attempts. The next upgrades can be decided by you but I created a good skill order for aatrox that might you find useful in LoL.